What would make Los Angeles an even better place to live? In 2016, AARP staff posed this question online and in person via listening posts — large writing surfaces stocked with markers and pens — in South Los Angeles. In both in­stances, community members were asked to weigh in on this simple, yet essential question. Responses formed a true snapshot of the intersection between the existing beauty of communities and the endless possibilities of how they can be made even better; they ranged from affordable housing, to safe parks, reliable transit and intergenerational connectivity. In the spirit of this unique cultural collage, AARP commissioned Synthia Saint James – a celebrated self-taught visual artist, author and true age-disruptor – to use her unique talents to draw insights from the public response and create an original piece titled “Our Community.” The portrait draws vibrant colors and distinctive shapes to portray a community that is safe, active, and inclusive. 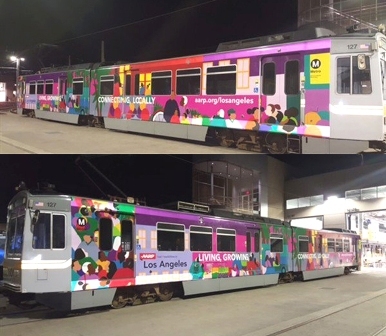 It will brighten commutes when it appears on LA Metro Expo line trains beginning this August. The piece not only paints a picture of the community as its residents see it, but it also illustrates how communities can embody AARP’s 8 Domains of Livability – the idea that the built environment and the social environment should have qualities that benefit people of all ages and abilities. This interactive project has provided members of the community with an opportunity to envision their neighborhoods as they wish to see them, and it has brought that vision to life through the use of art. “Our Community” is the second installment of AARP in Los Angeles’ ongoing “Portraits of Community” project. In 2015, we invited Yolanda Gonzalez – a celebrated Chicana painter, art educator and punk rocker at heart – to be the inaugural artist for the project. The culmination of the first phase of this project saw Gonzalez’ artworks featured on a Metro Gold Line train. AARP in Los Angeles is proud to continue fostering this unique project by helping communities who are Living, Growing, Connecting – Locally!